The Multi Mission Aircraft (MMA) belonging to the Colorado Division of Fire Prevention and Control has been supporting the #WestonPassFire by providing perimeters, acreage and imagery of the fire. Using Infrared-Sensor technology and on-board computer systems, the primary mission of the MMA is detection in addition to providing information to ground forces during wildfires. This afternoon, isolated showers and thunderstorms again precipitated a warning to firefighters of cloud-to-ground lightning. Campground of the Rockies Association received wetting rain this afternoon with .12” received at Jones Hill RAWS and .32” received at a higher elevation in the Buffalo Peak Wilderness west of the fire. Temperatures reached 79° with winds out of the ESE 7-10 mph with gusts to 21 mph. This evening showers and thunderstorms will end around 7:00 PM with a minimum temperature tonight of 50°. Monday will be mostly sunny with a maximum temperature of 80°, minimum humidity of 15-20%, NW winds 3-5 mph through 10:00 PM, then SE 8-12 mph with gusts near 18 mph. No storms are expected. 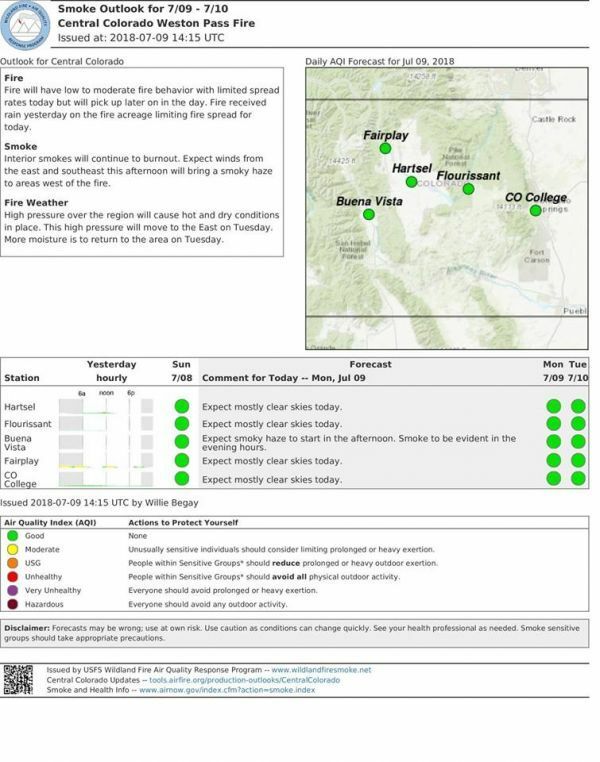 This weather will increase the likelihood of seeing smoke from unburned fuels igniting within the perimeter of the burn area. North of the fire, crews patrolled and improved line along the fire edge and along the contingency line north from Rough and Tumbling Creek, and west to CR 22. Surface improvements to CR 22 will be completed early this week. To the south and east, firefighters patrolled line to secure and hold the perimeter. Crews continued chipping brush and limbs that were removed to improve the contingency line... 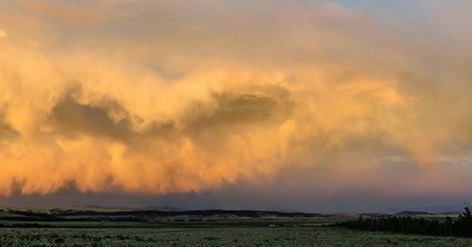 The Buffalo Peaks Wilderness area and the direct fireline.. received water drops from helicopters to cool the fire line. A “gel” plant was set up to enhance fire suppression efforts. Gel mixed with water will be applied directly to the fire edge by helicopters, tomorrow. This will make the water more effective. Evacuations in the CR 22 and CORA areas remain in place. Evacuation status may change and evolve. Highway 285 remains open in both directions with a speed limit at 50 mph and there is no stopping in the fire area. Full release available at https://www.facebook.com/westonpassfire/ . 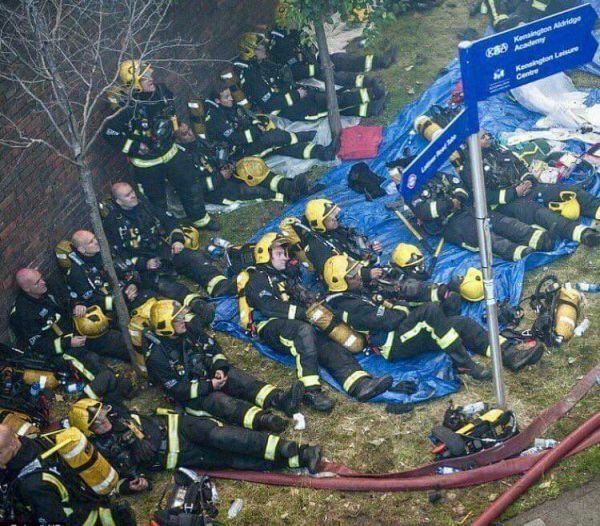 At the end of the day, this is what heroes look like. It's a clear and sunny Monday on the Weston Pass fire! A great day for aerial operations like bucket work and water drops. Drier, warmer weather is conducive to unburned fuels igniting inside the fire perimeter, so visible smokes will be present today. At 12:00pm today, eight residents in the evacuation area south of Park County Road 22 will be allowed re-entry to the area. In order to gain entry, the residents must present a special identification card which can be obtained at the Park County Facilities Building at 1295 County Road 16 (also known as 1295 Castello), Fairplay, Colorado, during regular business hours from 7:00am to 4:00pm. Dumpsters will be located at intersection of County Road 5 and 22. IREA has restored power in that area. For any questions about this re-entry please contact pio@parkco.us or 719-836-4306. At 2:00 this afternoon, there will be an aerial update with Operations on Facebook Live at https://www.facebook.com/westonpassfire ... 9194635925 . The exact web link will be posted as soon as it is available. Containment on the fire is 52%. Last night, the fire received more rain, .24” on Jones Hill and .45” at the RAWS site in the wilderness area on the west side of the fire. Today will bring 77°- 80° temperatures and 16-20% minimum humidity with 8-12 mph winds from the ESE with gusts to 20 mph after 12:00 PM. Skies will be mostly sunny in the morning becoming partly cloudy in the afternoon. No storms are expected today. This evening, temperatures will dip to 46°-51°, with humidity recovery to 55-60% and zero chance of wetting rain. Parts of the fire received beneficial rain of a short duration. With the sun warming and fuels drying, expect to see interior smokes within the fire perimeter. Firefighters monitor these smokes on the ground by strategically placing lookouts and by air with air resources and helicopters. At night, engines patrol to assure that the fire stays within the containment line. Activity on the north side will include patrolling and securing line, making improvements on CR 22, and allowing only residents along CR 22 to return to their homes. Security will be posted at the neighborhood entrances to check passes. On the east side, the fire containment line was extended south along FS 168 to FS 155 increasing total containment to 52%. Crews will continue to patrol and secure along this line and begin the rehab process (returning the land to a more natural state) where needed. 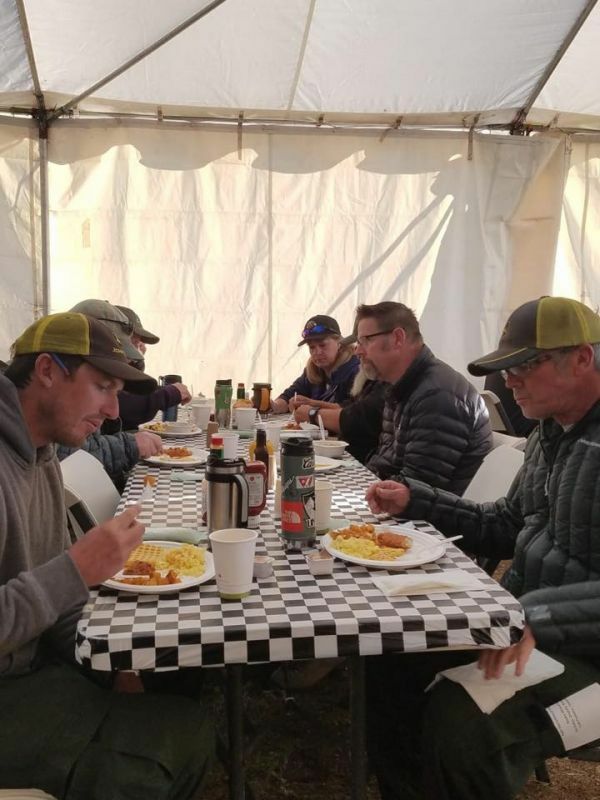 Division P will secure the fireline to the Buffalo Peaks Wilderness (BPW) and work on more active fire areas with helicopter bucket operations. Contingency lines on the south side will be improved by using the chipper to deal with fuels brushed out as the line was developed. A multiple mission aircraft (MMA) and infrared flights will identify hotspots to direct crew operations. Helicopters will drop gel suppressant on the hot spots in the BPW area. The purpose of gel suppressant as opposed to retardant is that suppressant is long lasting and changes the nature of the fuel so it won’t burn. Crews and dozers will cut contingency line from DP 55 west to the Lynch Creek Trailhead. Evacuations in the CORA area remain in place. Evacuation status may change and evolve. 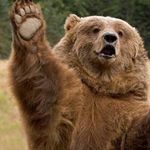 Buffalo Peaks Wilderness area is closed until further notice, please visit https://www.fs.usda.gov/psicc. Highway 285 remains open in both directions although the speed limit 50 mph and there is no stopping in the fire area. Chipping is currently going on in Division T on the south end of the fire. There's too much fuel here for the conditions in this part of the fire, so crews will remove individual trees to reduce the fuel load. 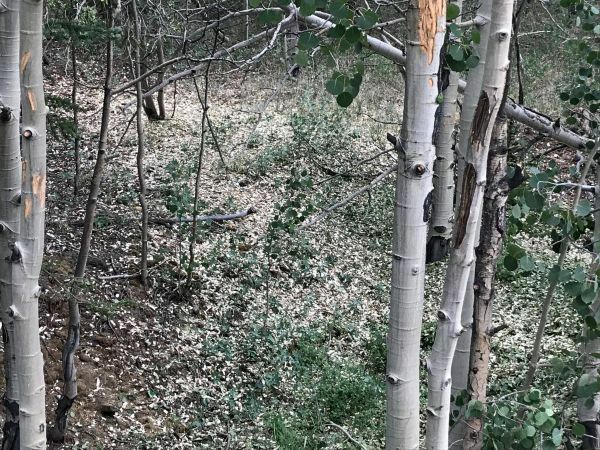 Firefighters are using chippers to reduce the trimmed Aspen trunks and limbs into shredded material that resembles mulch. 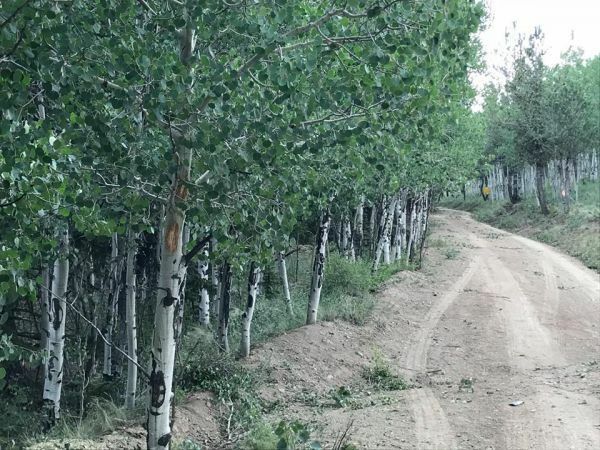 This stand of Aspen is being thinned to remove fuel from the roadside. These chips will add material to the forest floor that can help slow or prevent erosion. This can occur after woody material rooted into the ground is burned and the remaining soil is no longer held in place. ETA 14:37: The briefing itself should begin momentarily. ETA 14:45: The crew is aware of and working on audio problems. ETA 14:56: The video will be available to watch soon, although the audio was not fixed while live. A mostly sunny today with a high of 79°, 18% minimum humidity with 5-10 mph winds from the ESE with gusts to 22 mph has dried the fuels. Some clouds formed in the afternoon; but no storms are expected today. This evening, temperatures will dip to 46°-51°, with humidity recovery to 55-60% and zero chance of wetting rain. The moisture on the fire yesterday limited fire behavior and spread today. Burning will be mostly limited to heavy downed fuels tonight. The sun dried fuels today and with current drought conditions, we expect to see more interior smokes within the fire perimeter tomorrow. Firefighters on the north side patrolled and secured line. Park County made improvements on CR 22 and evacuated residents along CR 22 were allowed to return to their homes. Security is posted at the neighborhood entrances to check passes. On the east side, the fire containment line was extended to the west into Division P increasing total containment to 63%. 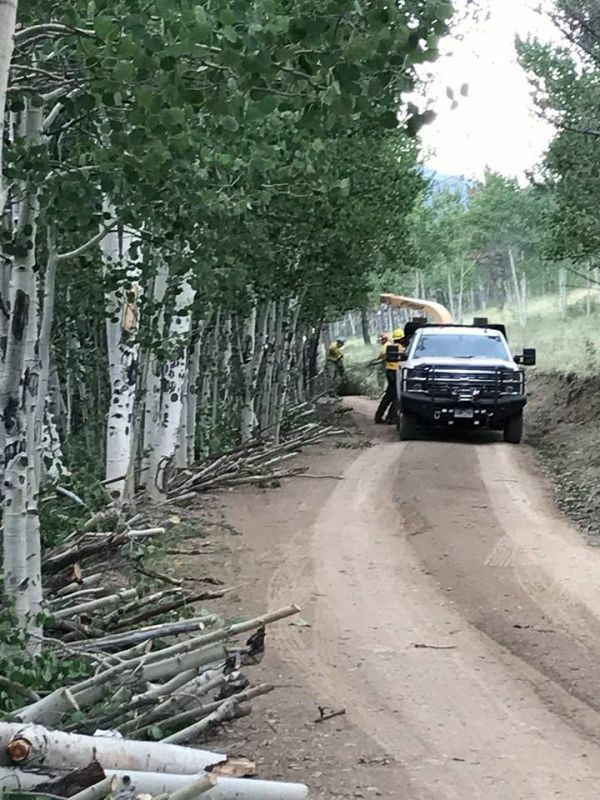 Crews continued to patrol and secure along this line and begin the rehab process (returning the land to a more natural state). Division P secured the fireline to the Buffalo Peaks Wilderness (BPW) and worked on more active fire areas with helicopter bucket operations. Chipping operations continue along contingency lines on the south side of the fire. Helicopters bucket-dropped gel-enhanced water on the hotspots in the BPW. Crews and dozers cut contingency line from DP 55 west to the Lynch Creek Trailhead. Hotshot crews cut fire line from the BPW boundary to meet dozer created fireline coming from the north. There were no requests for initial attack resources today. Engines will patrol tonight to assure that the fire stays within the containment line. Highway 285 speed limit is 50. There is no slowing or stopping near the fire. 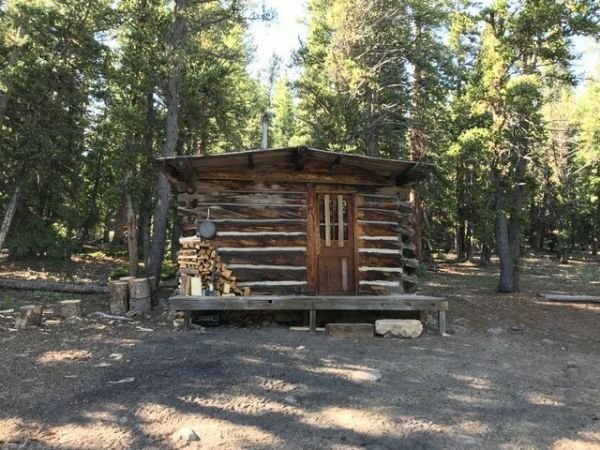 This is the US Forest Service miner's cabin. It received point protection during the fire. 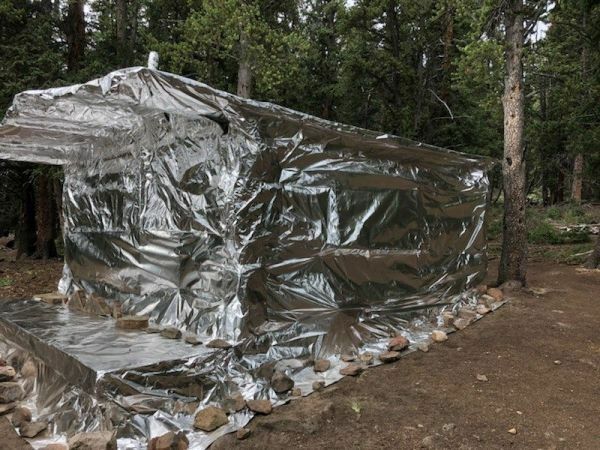 Firefighters protected this cabin by wrapping it in an aluminum foil wrap and stapled it in place. 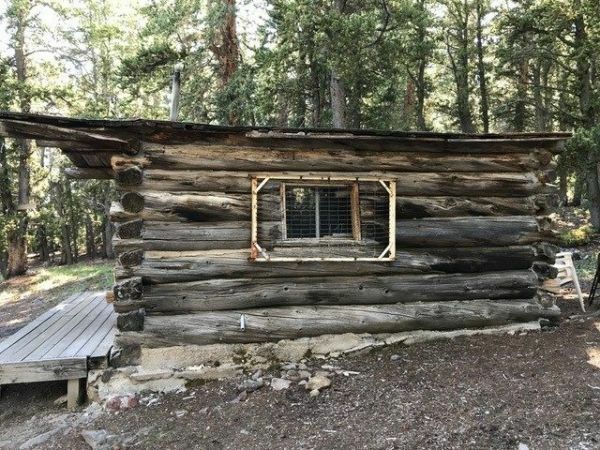 Here's the side of the US Forest Service cabin before it was wrapped. 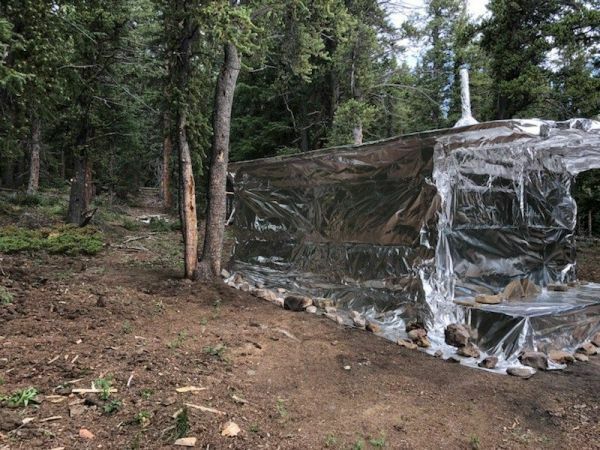 The wrap material is the same that's used to make the fire shelters that firefighters carry on the line. This wrapping is done in lieu of setting up sprinklers, another tactic used in point protection. Firefighters determine which tactic to use based on a number of variables.